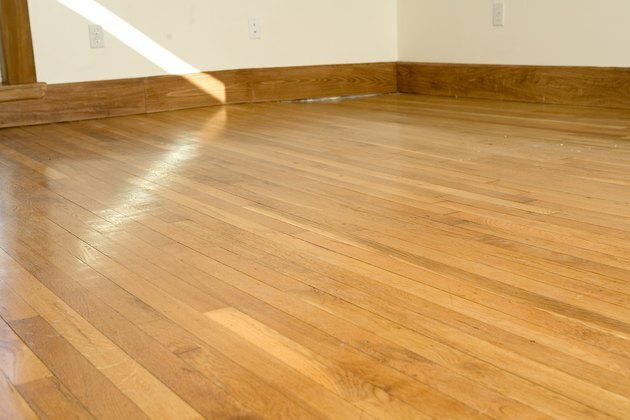 The last step in finishing hardwood floors is to apply one or two coats of polyurethane. It will help protect the floor and will keep it looking good for years. Applying the polyurethane evenly is very important. To accomplish this task, a lambs-wool pad on an applicator should be used. Preparing the lambs-wool pad and attaching it to the applicator properly can ensure a successful result. Soak the lambs-wool pad in a bucket filled with mineral spirits for 20 to 30 minutes. This will make the lambs wool more absorbent and help it spread the polyurethane evenly. Remove the lambs-wool pad from the mineral spirits. Gently wring it out so that it remains damp but not soaked. Install the lambs-wool pad on the applicator head by removing the two wing nuts that hold the two pieces of the head together. Wrap the lambs-wool pad around the bottom part of the head so that the wool is facing out. Make sure there is an even amount of the pad overlapping the top of the head on both sides. Place the top of the head onto the bottom piece trapping the lambs-wool pad between the two parts. Tighten the wing nuts to secure the pad in place.